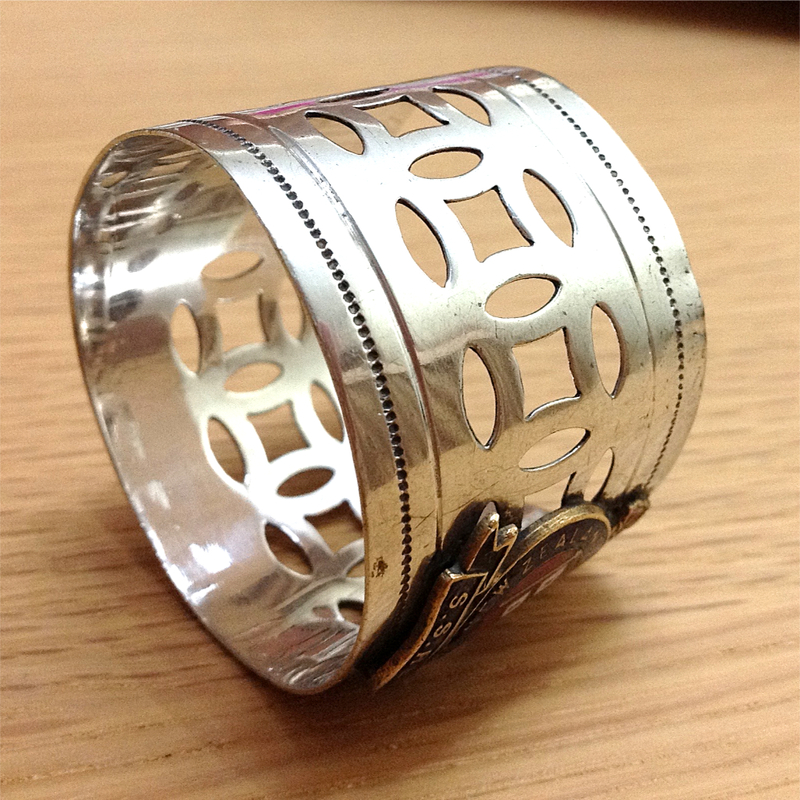 As a follow up to my previous serviette ring post, here are two more rings from my collection. These two seem to be a bit less fancy than those in the previous post which were more obviously produced as souvenirs for sale to passengers. I’d love to know if they were actually used on board. 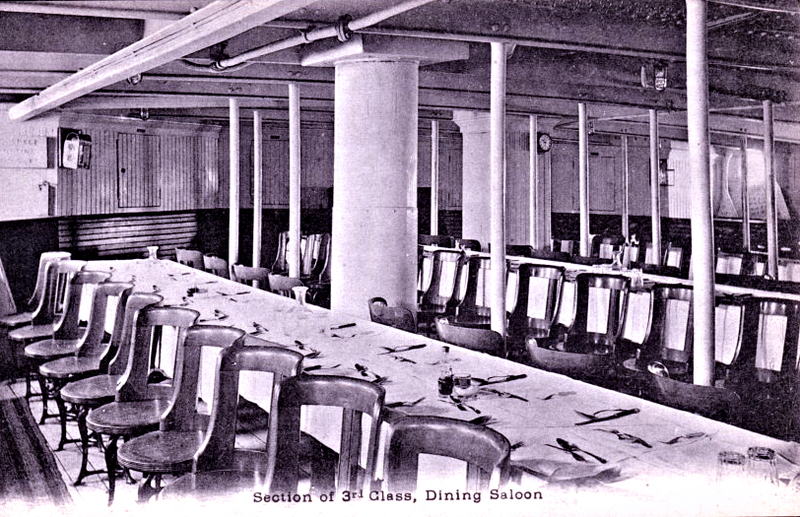 However, with the possible movement of the ship, anything which would cause a serviette to roll off a table would not have been particularly practical. Please leave a reply if you have any more information. This entry was posted in Collectables, Remuera, Uncategorized and tagged Remuera, serviette on 04/02/2019 by printerspie. 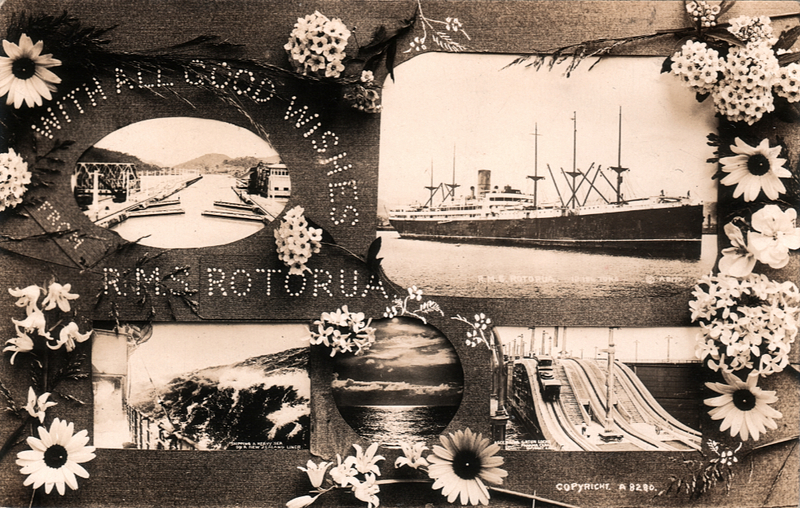 This is an excellent example of an early real photo montage postcard published by the New Zealand based professional photographer David Aldersley. I have several of the small photographs on this card in my collection as full size postcards, including the two Panama Canal views which are also shown here on this Blog. The rough sea image can be seen full size in this Blog entry. The back of the postcard is rubber stamped with David Aldersley’s “Ingleboro Photo Series” credit which I have catalogued as style “H”. My free guide to postcard backs is available as a digital PDF publication and can be downloaded here. This entry was posted in Collectables, Panama Canal, Rotorua and tagged David Aldersley, Panama Canal, Rotorua on 13/09/2018 by printerspie. Thanks to Ian Wilkinson for sending me scans of this leaflet. 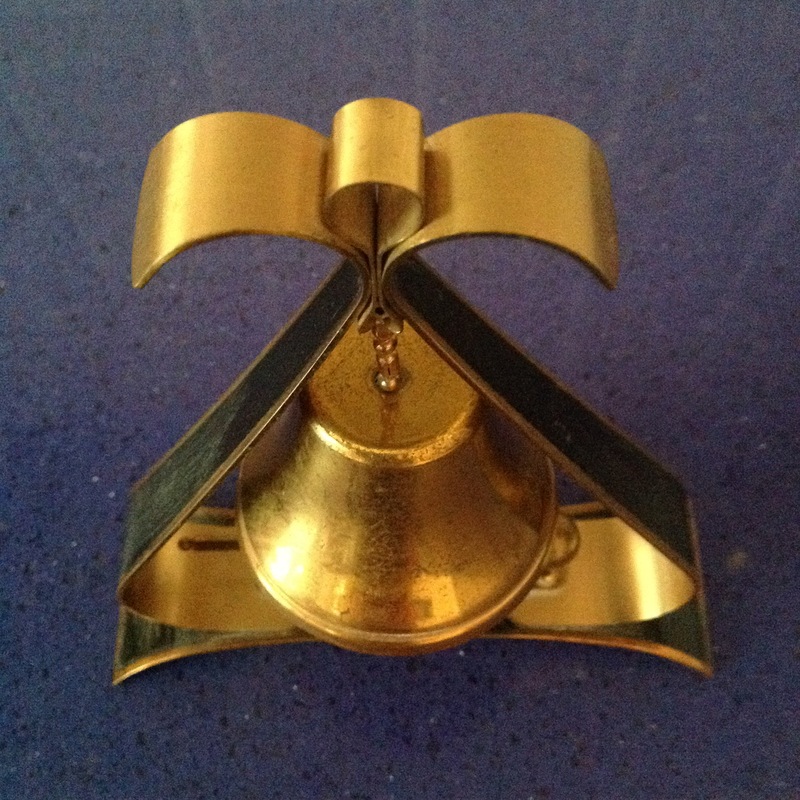 It was produced to give to passengers on ships which called at Pitcairn Island, and is signed by Pervis Young. Pervis Ferris Young (1928-2003) was magistrate of Pitcairn Island from 1967 until 1975. He was the son of Andrew Young, Pitcairn’s first radio operator. 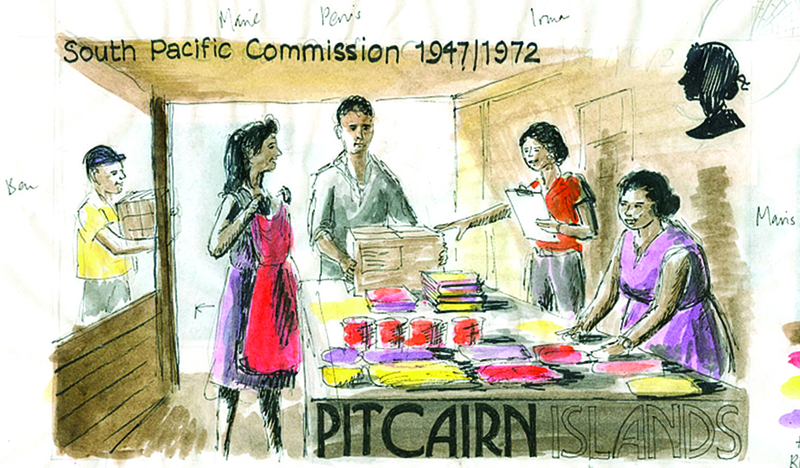 Pervis was sketched by the late Jennifer Toombs, stamp designer, for her 1972 South Pacific Commission stamp, where he is shown third from the left. Jennifer spent ten days on Pitcairn in 1966 when Pervis was her mentor and guide. This entry was posted in Collectables, Pitcairn and tagged Collectable, Jennifer Toombs, Pervis Young, Pitcairn on 10/08/2018 by printerspie. 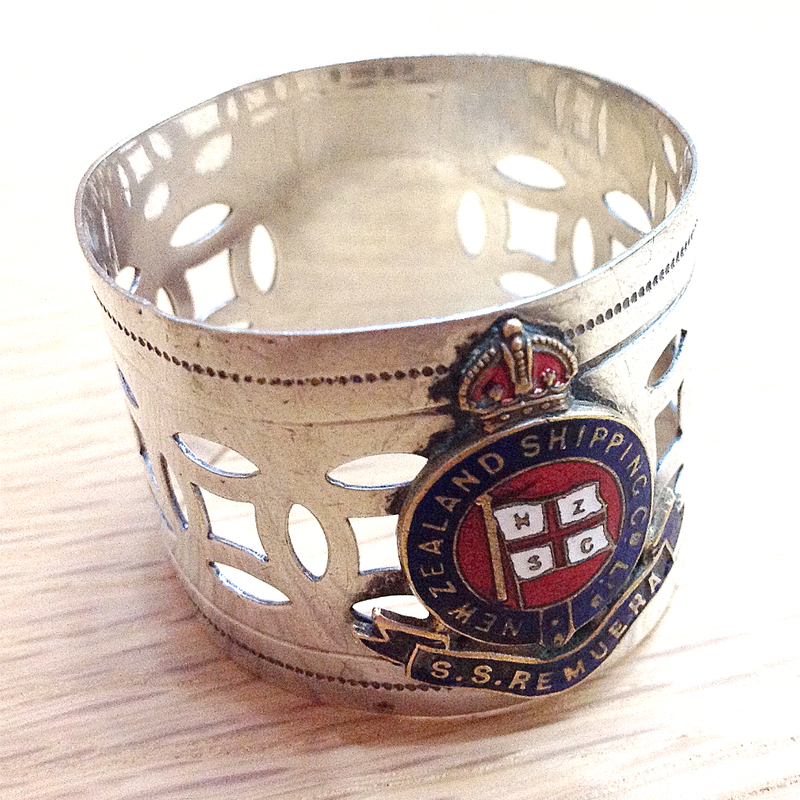 A very popular souvenir produced for sale to passengers on the Remuera was the serviette or napkin ring. 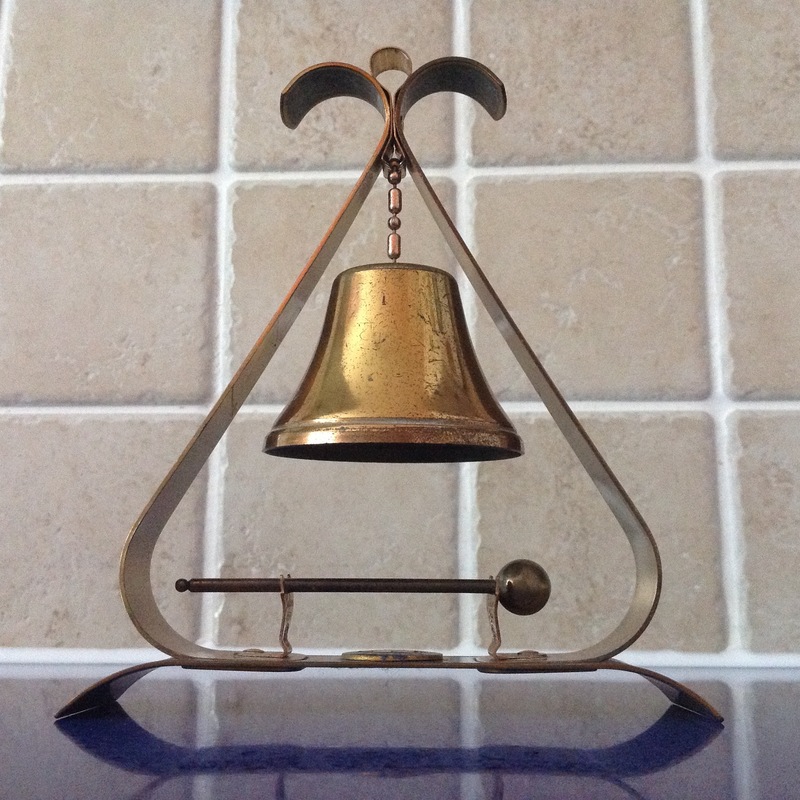 These don’t appear to have been in use on the ship, but just produced for sale along with many other items including teaspoons, lighters, goblets, vases, table lamps, bottle openers and even embroidered cushions. The souvenir shop must have been bulging at the beginning of each voyage. 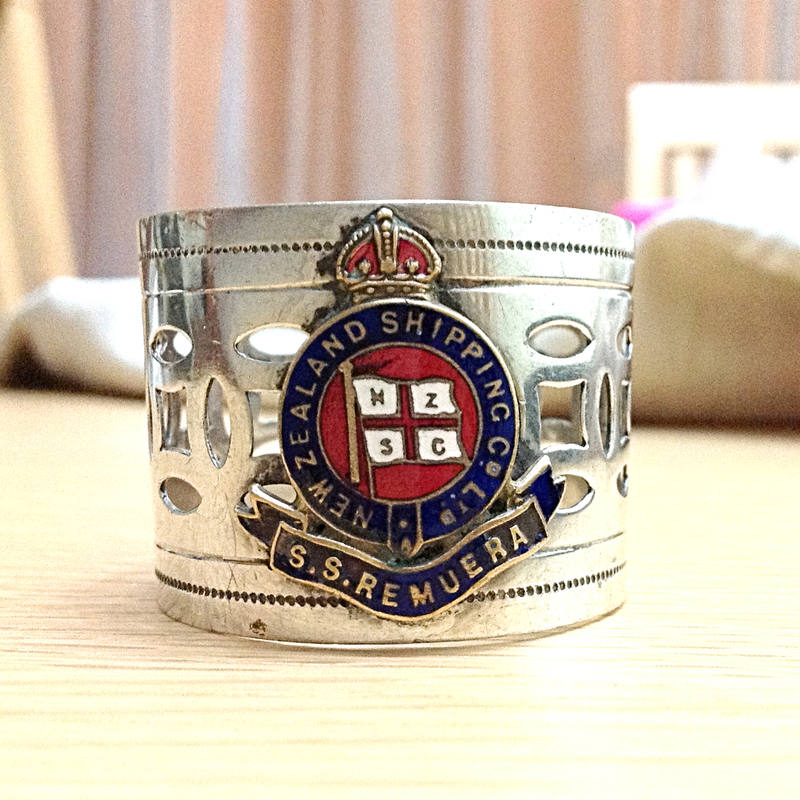 The website RMS Remuera shows a further four designs of serviette rings, dating back to at least 1926. 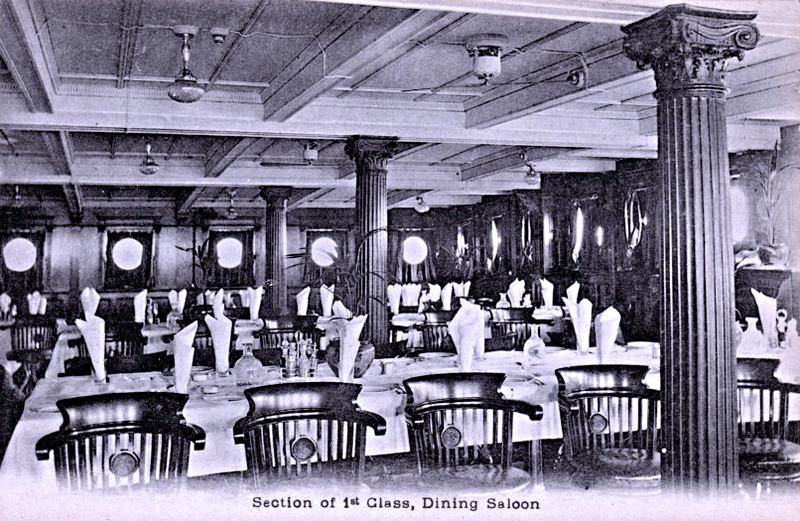 Another postcard, this time showing the 1st Class Dining Saloon. 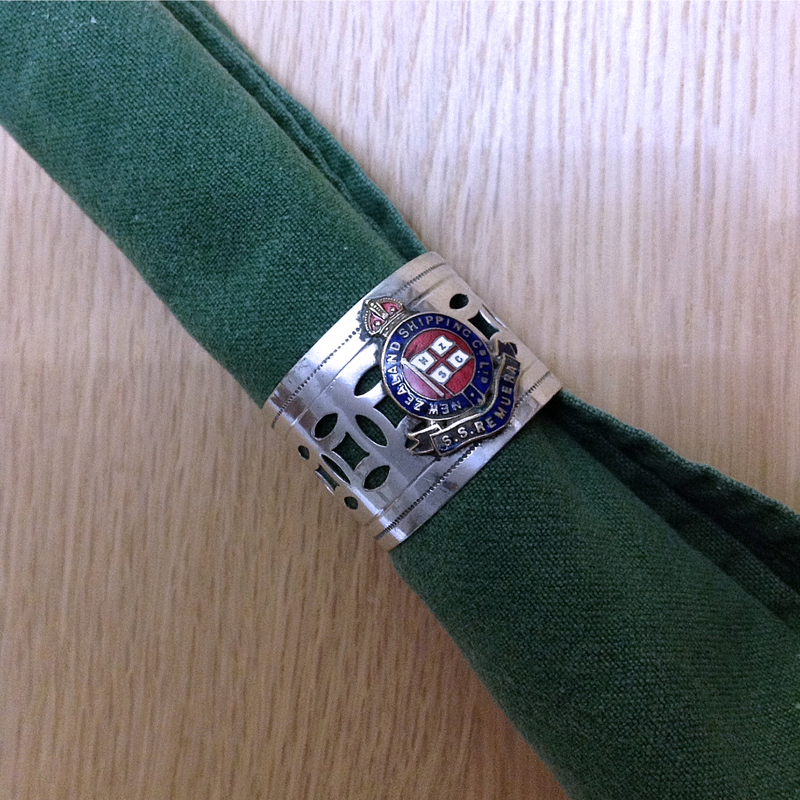 The serviette rings are seen inserted in the glasses. Would they have done this in rough weather I wonder? This entry was posted in Collectables, Remuera and tagged Collectable, Remuera on 12/03/2017 by printerspie. On a recent visit to a local postcard fair, I managed to purchase this atmospheric real photo postcard taken on board a mystery ship. 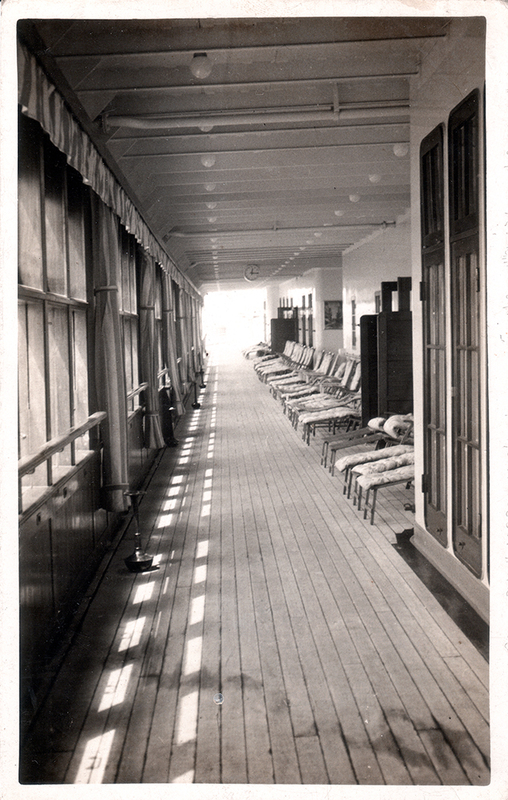 I love these photographs because they make me want to take a walk along the deck, maybe rest a while in a sun bed, or just watch the open sea. Where are the passengers? Perhaps all taking lunch, or maybe on a shore excursion? There are very few clues, but what got me most interested was the back. I have a small collection of 1920s photographs by New Zealand Shipping Company barber/photographer Henry George Keyse. Some of his photographs feature the back style shown below, and this mystery photograph has the same back. Now I don’t even know if it is a New Zealand Shipping Company vessel, and it is my great hope that one of the readers of this blog will be able to help me out. I have reproduced the whole postcard which you can click to see a larger image, and also a selection of close up areas which I hope will act as little clues to, as Hercule Poirot would say, get your little grey cells working! Please, if you can help in any way, give me your views in a comment. This is the back of a Henry Keyse postcard from the 1920s. The postcard above has the same back style, including the sun logo, but without the publisher text on the left hand side. This entry was posted in Collectables, History and tagged Collectable on 04/09/2016 by printerspie. 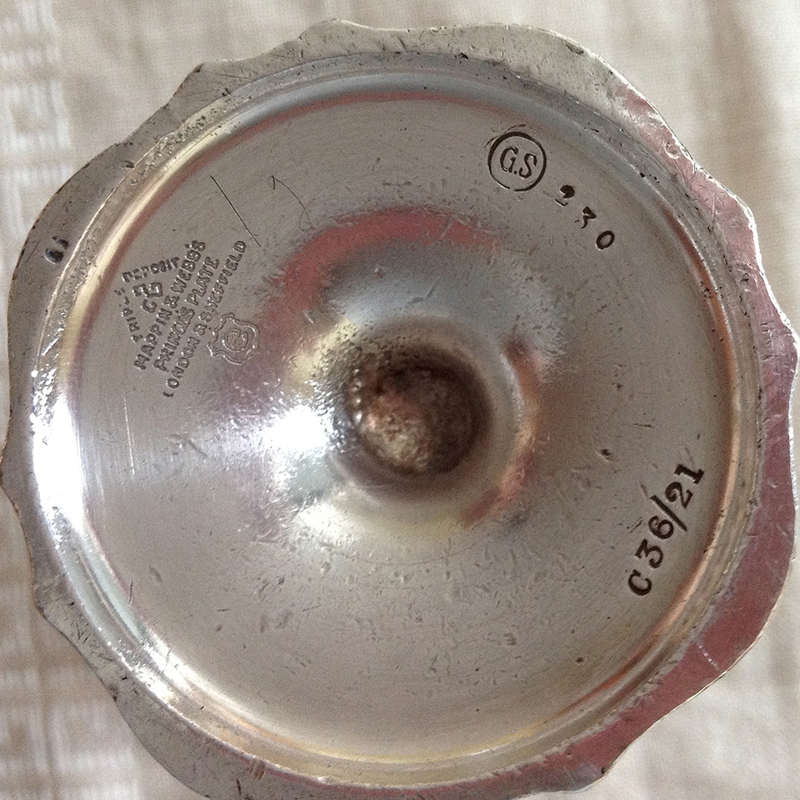 I have been unable to find out much about this New Zealand Shipping Company goblet, other than the details given by the eBay vendor. I managed to purchase it for an incredibly low price (£3.20 plus delivery), and I like it very much, so really the actual age does not matter to me. 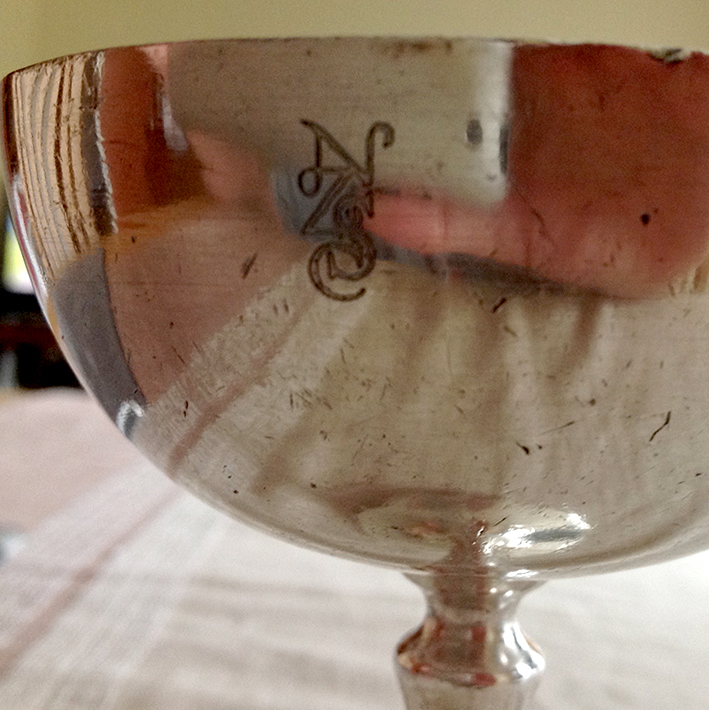 It has the letters NZSC engraved on the side of the bowl, and on the bottom there are details which can clearly be read in the photograph shown below (click on it to enlarge). It is a heavy item (252g), but rather uneven . . . I can imagine it having fallen from tables on several occasions in rough seas. If stood upside down now, it rocks slightly. I like to think of it as being in use on one of the oldest of the Company’s ships, perhaps being used by one of the old Ruahine’s 74 first class passengers, but I guess that more likely, and less romantically, it was simply sold as a souvenir. 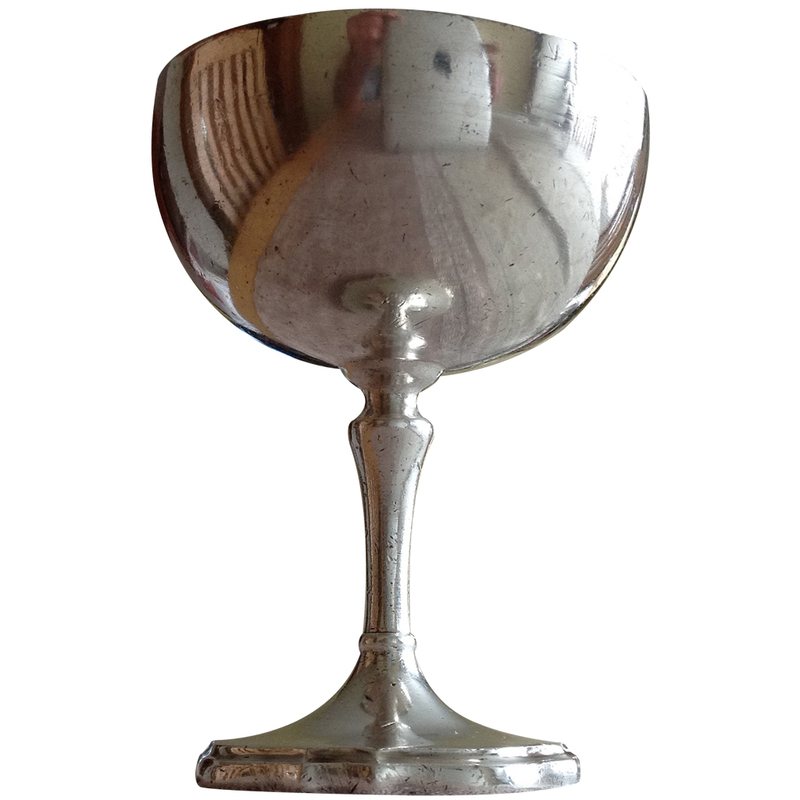 I have made the rather wobbly video below to show off the goblet. If you can provide any further information, please comment in a reply to this blog entry. *I have had a reply from Mappin & Webb, but unfortunately I am no wiser. If you can help with a dating method, please let me know. They did not realise my purchase price when I contacted them, but I don’t really want to spend more than I paid for the item to get a valuation! This entry was posted in Collectables and tagged Collectable on 29/07/2016 by printerspie. 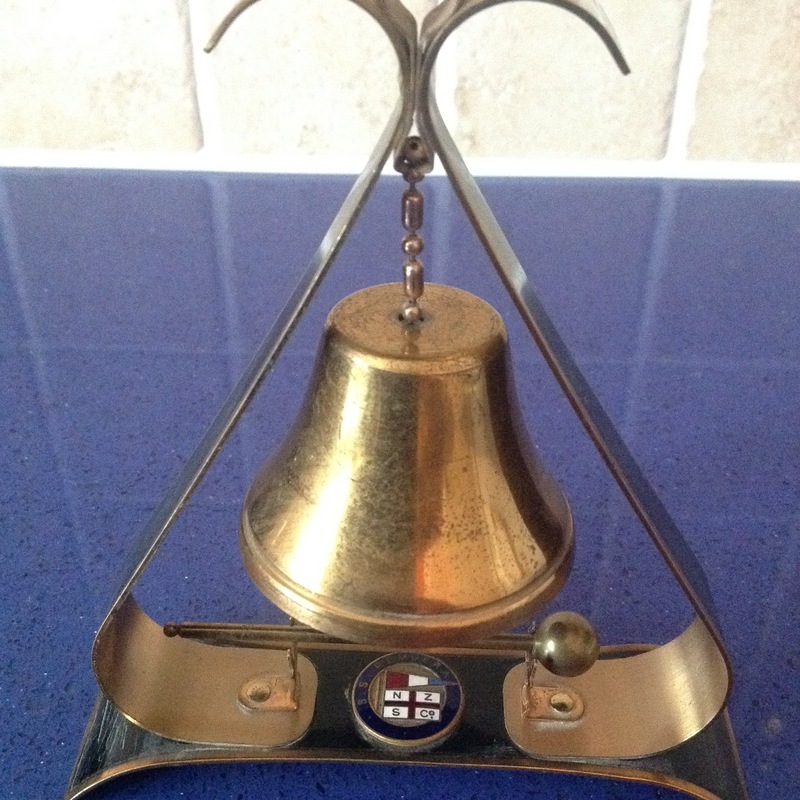 This rather nice souvenir ship’s bell was certainly made between 1911 (when the Remuera launched), and 1940, and at a guess I would say it is 1930s or perhaps a little earlier. I am confident that it is before 1940 because that is when the Remuera was torpedoed by aircraft off Scotland (on 26th August) and sunk. She had been sailing as part of a large convoy. On her last voyage, the Remuera sailed from Wellington on 12 July 1940 for London, with one of the largest cargoes she had carried during her long career but without passengers. … At about 9.15 a.m. on 26 August, the convoy was crossing the entrance to Moray Firth and was about fifteen miles north of Peterhead, when the first attack was made by a single German aircraft, one of whose bombs missed the stern of the Remuera by about thirty yards. At 9.35 a.m., an attack was carried out by torpedo-carrying aircraft off Kinnaird Head. The Remuera opened fire on one aircraft but its torpedo struck her on the port side. 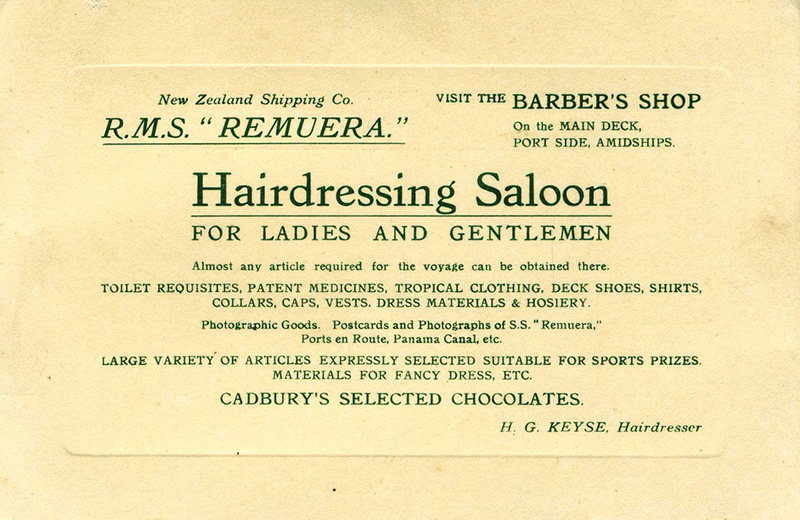 This advertising card (above), known to be in use during a 1926 Remuera voyage, shows the large range of products stocked in the Hairdressing Saloon, even including ‘materials for fancy dress’, which would have been very useful for the passengers’ entertainment on the long voyage. 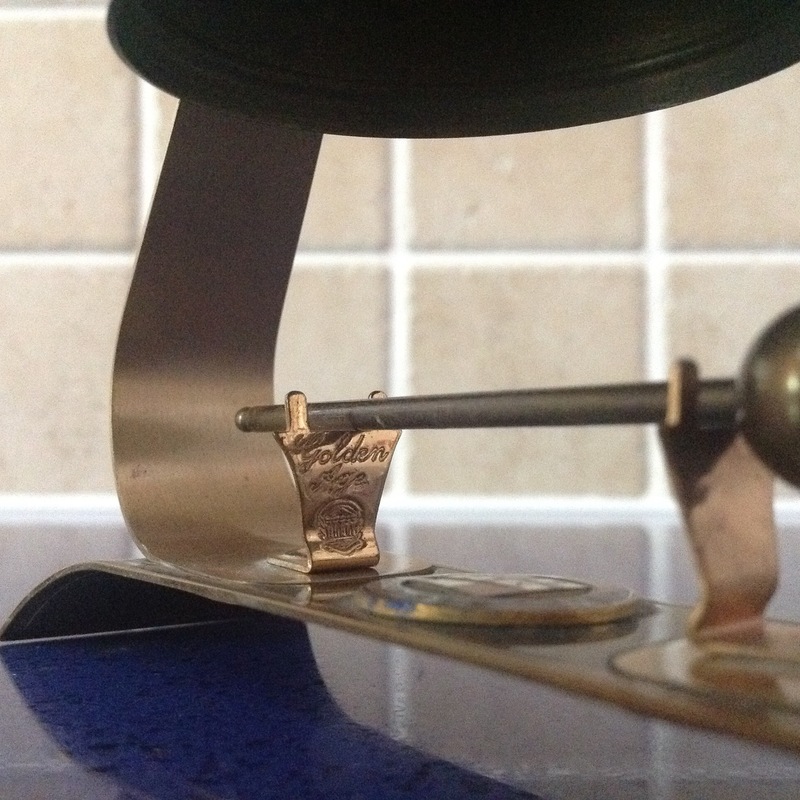 It is an extremely sturdy metal item that has lasted well for more than 75 years. I would be interested to see how many of today’s souvenirs survive in years to come. This entry was posted in Collectables, Rangitata, Remuera and tagged Henry Keyse, Rangitata, Remuera on 23/07/2016 by printerspie.